Pickles are a thing (well, a vegetable) that I take for granted. I like them on burgers, in sandwiches chopped up in tuna, and sometimes just straight out of the jar. They were never something I would have ever thought about making before. But then I had a lot of mason jars sitting around the house and I needed stuff to do with them. First, I made granola and gifted it to friends and family. Then I went to the local market and got some fresh fall flowers to decorate my home. And then, I made pickles. It was a very exciting activity to do I am now a pickle maker extraordinaire. I just kind of threw things together hoping it would make a good pickle, and it worked! They were pretty spicy with the addition of red pepper flakes and big hunks of garlic, and I loved it! 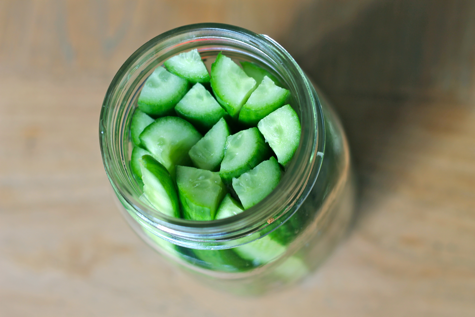 Cut cucumbers in 1/4s or sliced horizontally. 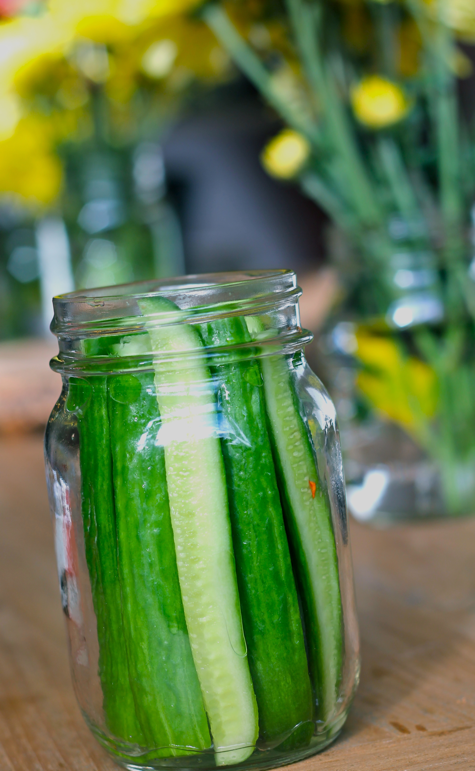 Fit as many cucumbers as you can into the mason jar without having to force them in. In a measuring cup, mix together the water, vinegar and salt. Stir until salt is dissolved. 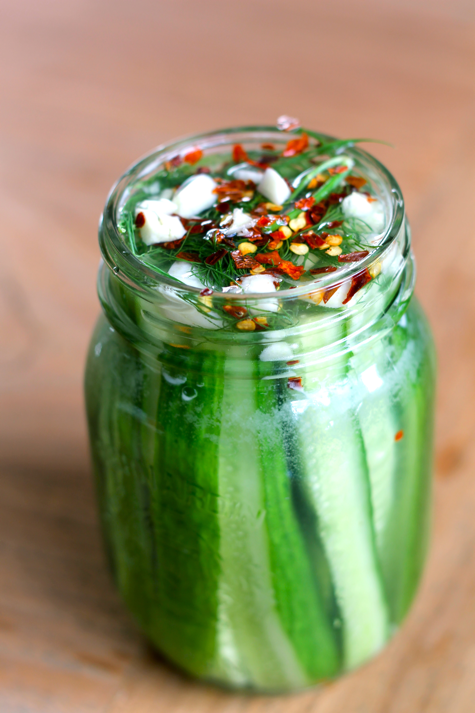 Pour liquid over cucumbers so that they are completely covered. (if a bit are sticking out, can add some more water). 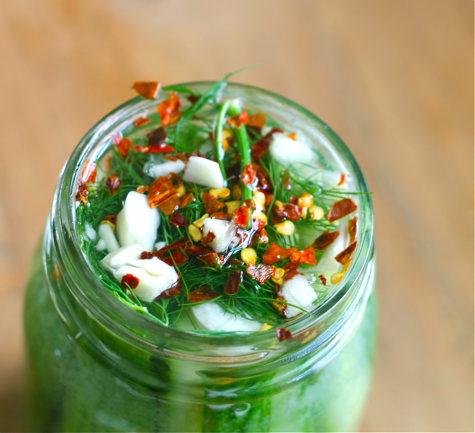 Top the cucumber with the dill, garlic and red pepper flakes and screw on the lids of the jar. Put in fridge and wait 48 hours before eating! I got a few herbs for a makeshift garden on my little ledge (its NOT a balcony) that I really enjoy taking care of. 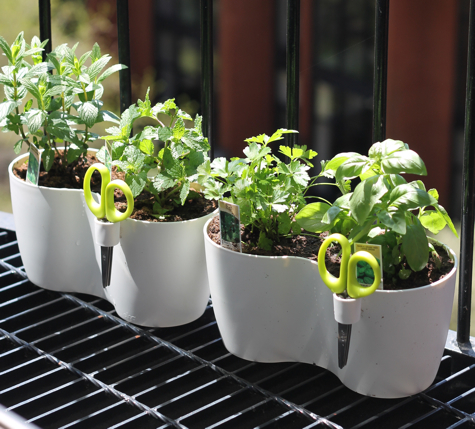 See that basil plant? He kept me company while studying for my medical licensing exams. He sat right next to me all day, and I made sure he got all the sun and water he needed. I sound like Tom Hanks with his ball named Wilson from Cast Away, eh? I think I did get a little cabin fever while stuck inside studying. Now that Im on vacation though, I can let my plants outside for some sunshine (when we get it) and then I get to use them in my cookingand I guess for company too! Wohoo! My mint was getting outta control so I snipped it good, real good. 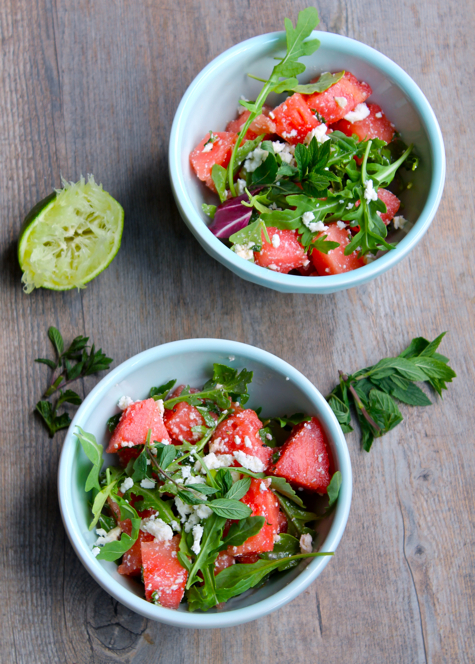 And thats how this watermelon salad came to be. Thank you my minty friends. 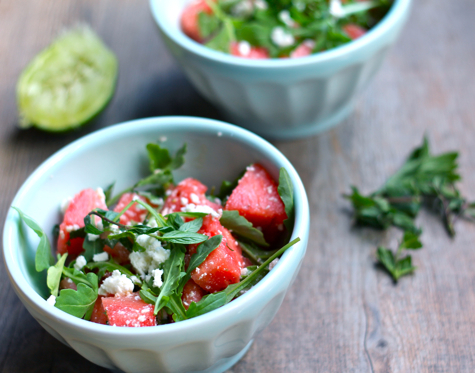 This salad is really awesome as a side to any BBQ. Ive made it twice in the same week once as a side for steaks and another as a side for lamb. Its fresh, creamy, peppery, zesty and every other adjective. Its a real winner. And a Jennie Original. Mix together the olive oil, lime juice, honey, salt and pepper. Set aside. 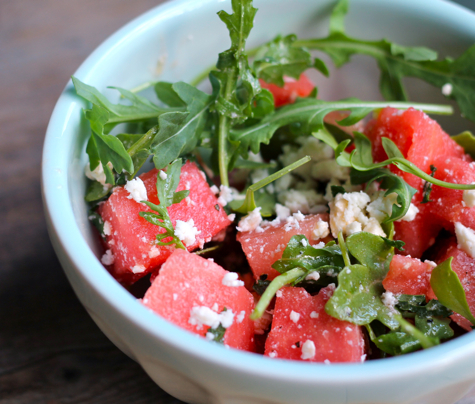 When ready to serve, place in a large bowl the watermelon, mint, arugula and feta cheese. Toss with the dressing and serve. Its an easy one. And a yummy one. And a healthy one. Oh My! Guess you should try it out! Who ever said fall had to be full of squash, pumpkin and zombies (duh- halloween)? Side Comment about Zombies: Is it normal that when I hear the theme song for the Walking Dead through the thin walls of my neighbors apartment that I want to dress up in dirt and and scare the living crap out of them? I mean, they are super loud all the timeso they deserve to poop themselves. Its Fall. Everyone is wearing un-form fitting sweaters, layers, and cooking/baking something orange. My kitchen has never conformed to rules, if anything I step so far away from them like the time it was a seriously cold canadian winter day and I made a Thai Mango salad. Im different! So Goodbye pumpkin, hello vibrant colors! 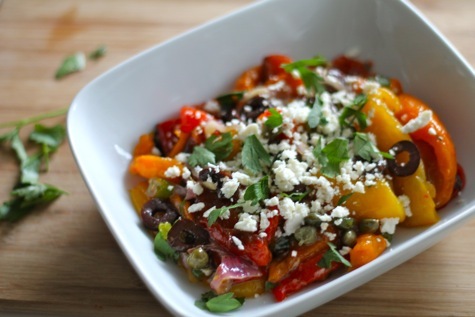 The best thing about this salad, is how versatile it is take out what you dont like, add what you do! You can also 1) serve it with just the peppers (or the additions) as a side for many meat or fish dishes, 2) put on baguette for beautiful crostinis, 3) Toss it with arugula for a fullfilling salad. 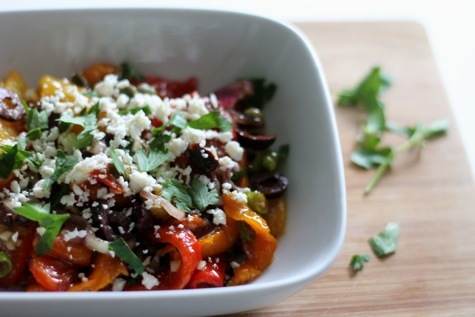 Cut peppers in half, removing seeds. Line peppers on a large baking sheet and roast them for 45 minutes to 1 hour. Once they’re fully roasted, cover the pepper tray with another piece of foil and let the peppers cool. When they’re cool enough to handle, remove the skins and slice sections of pepper into 1/4-inch wide strips. 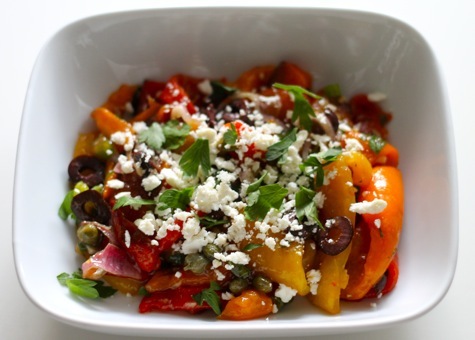 Toss peppers with oil, lemon juice, garlic and a few pinches of salt. Cover and let marinate for an hour or overnight (and up to 4 days) in the fridge. Add capers, olives, green onions, shallots and parsley. Stir to mix. 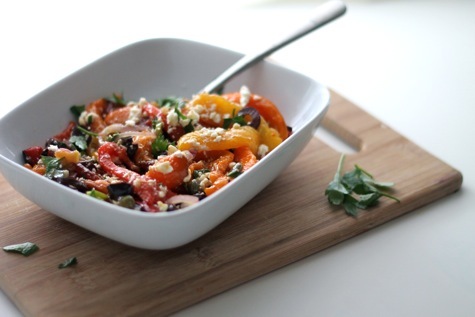 Add feta to top of plate when serving with a sprinkle of parsley and black pepper. Hope you enjoy this salad! You can change it to how you like it, and serve it in a number of ways! Its a go-to at my table when it needs an extra pop of color. The smell of tomato had been wafting through every market/grocery store this past little while. They are beautiful shapes and colors and are screaming to be used. Except if youre cooking for my boyfriend he hates tomatoes! 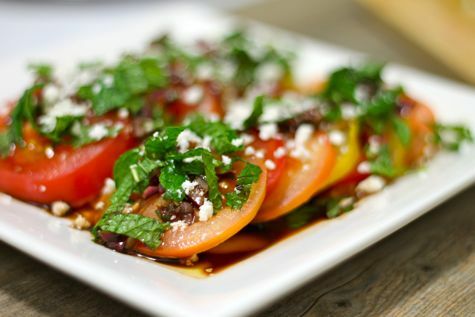 So, it was not a great idea last summer to make a meal in which tomatos played a role in every dish. You know, like brushetta, tomato and buffalo mozarella salad and spaghetti with fresh tomoato sauce. No, that would just be silly. Isnt he a lucky guy to have a gal like me?? oops. So this year, I knew that it would only be fair to eat all the tomatoes by myself. And boy, I was a lucky gal! The sweet tomatoes with the spicy peppers and smooth cheese all amazing! Whisk balsamic vinegar with oil, sugar and salt in a small bowl. Stir in onion and jalapeno. 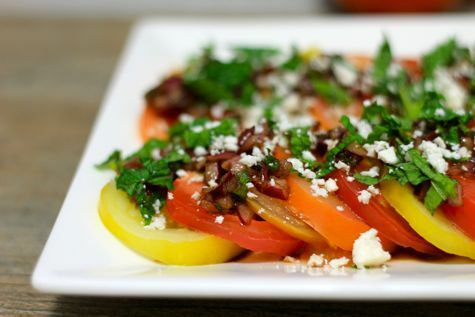 Thickly slice tomatoes and arrange on a platter. Pour dressing evenly overtop. Let stand 30 min. Sprinkle with mint and cheese. Any of my friends in my medical class know how stressed out I am right now, because they are too. Now is the time to decide what we want to apply to next year. It is frightening. What do you want to be when you grow up? The answer was easy when I was 10, but nowwell, im now hurtling towards my 30s (oh g-d) and I just dont want to answer that question. It comes with where will you live? Where will you work? Will you have a family? So Ive decided to regress. Im taking a page out of my psychiatry textbook and pulling the defense mechanism card regression. 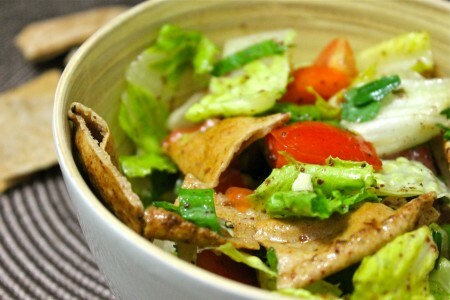 Example A: Ive made a a fattoush salad. Kinda sounds like fat tush. 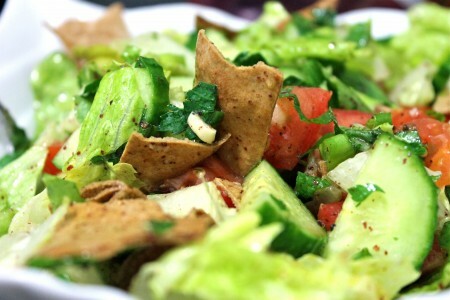 Regardless of my current immaturity, fattoush is a lebanese salad that is lemony and tasty.I highly suggest you try it! The only odd ingredient is Sumac, and you can find it at any middle eastern grocery store or even your neighborhood grocery store (ive seen it at both!). Preheat oven to 375ºF. Spread the pita chips in a single layer on a baking sheet and baking for 10 minutes, or until dry. Cool. 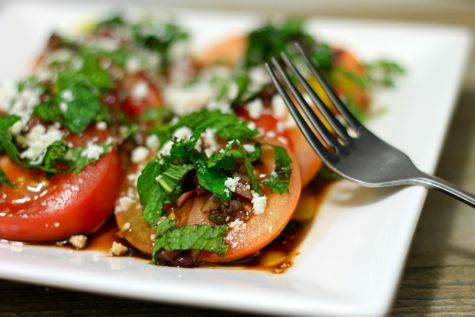 In a large bowl, combine lettuce, cucumber, tomatoes, green onion, parsley and mint. For the dressing, combine the garlic, salt, sumac and lemon juice. Whisk in olive oil. Add salt and pepper to taste. 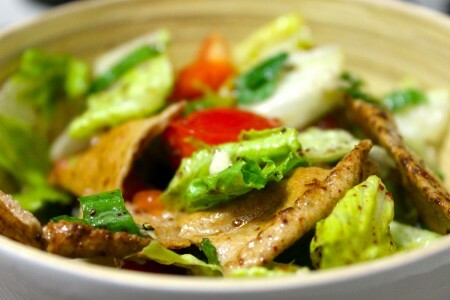 Add the bread to the salad before serving and toss the salad with the lemon dressing.